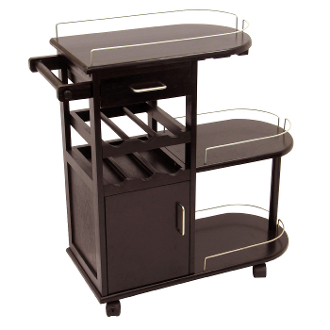 Bring the fun right to your guests with this handy rolling entertainment cart. It has plenty of storage which includes two racks to hold 6 wine bottles, a wine glass holder, open shelves lined with sleek metal rails and a shelf and drawer to keep your accessories. The chrome finished rails and handles compliment the cart to give a contemporary look to a cart that has great mobility with the 4 wheels and handle which doubles as a handle. The overall size of the cart is 35.4"W x 15.3"D x 35.9"H and has two rows each capable of holding three 730ml bottles of wine each. The top surface dimension is 24.4"W x 14.5"D and sits above a drawer with an inside dimension of 10.2"W x 11.9"D x 3.1"H. The middle shelf has a dimensions of 17.7"W x 13.75"D and has a clearance of 13.8" to the bottom of the wine glass holder. The bottom shelf is 17.7"W x 13.75"D with a clearance of 14.6". To the left sits a door which hides a cabinet 11.7"W x 12.4"D x 13.75"H in size. The cart is made from solid and composite wood in espresso finish. Assembly required. Cart overall size is 35.4"W x 15.3"D x 35.9"H. Top serving area is 24.4"W x 14.5"D.
Inside drawer dim 10.2"W x 12"D x 3.1"H; Cabinet size 11.7"W x 12.4"D x 13.75"H.
Constructed with combination of solid and composite wood in espresso finish. Assembly required.